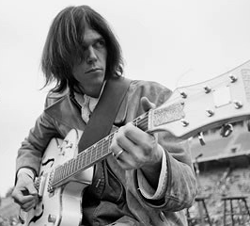 In 1971 Neil Young was invited to appear on the Johnny Cash show which was being taped in Nashville. Local producer/engineer Elliot Mazer met with Neil the morning after the show to try and convince him to record at Mazer’s studio “Quadrafonic Sound Studios. Nashville was (and still is) widely recognized for it’s dense population of amazing musicians and Neil was particularly impressed with the local studio players that were known as “Area Code 615”. Neil told Mazer that he’d only need a drummer, bassist, and pedal steel player, and that he’d like to begin recording that evening. 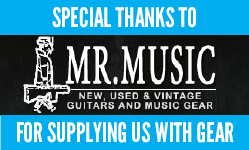 Being a Saturday in Nashville, many musicians were unavailable because they had gigs. Mazer scrambled and managed to round up some top notch players…drummer Kenny Buttrey, bassist Tim Drummond (who was just walking down the street), and steel- guitarist Ben Keith (later named “The Stray Gators” by Young). The four musicians assembled at “Quad” that evening and recorded the basic tracks for “Old Man, Harvest, Heart Of Gold, and a fourth song (Dance, Dance, Dance, that ended up being released on the later album “Crazy Horse”). Now I’ve heard the songs “Heart Of Gold” and “Old Man” more times in my life than I can count, and still, I can always find something different for my ear to latch on to. The “knocky” kick drum, the round, thumpy warmth of the bass, the “haunting” pedal steel…even the depth of the analog plate reverb…all such signature sounds of “Harvest”. Besides having to find top-notch players, a big part of recreating these sounds is also about trying to recreate situations. Reading interviews with engineer Elliot Mazer, I learned that the drums, steel, bass were all recorded live (together) along with Neil’s lead vocal and acoustic guitar. This is incredibly challenging on so many levels…for instance, the drums (being the loudest instrument in the room) will certainly also be picked up in the acoustic guitar mic, which is the softest sound in the room. This is also the case for the vocal mic. Apparently Neil was sitting about five feet from the drums…so Neil’s mics were definitely going to also be considered part of the drum sound. An inexperienced engineer might often move the acoustic guitar/vocal setup as far away from the drums as possible in the room in effort to minimize the spillage into the mics, but This is usually worse…although the level of the drums spillage is lower in the acoustic/vocal mics, the dimensions of the room become evident in the sound…the listener actually hears more room pollution, which achieves the opposite result. It’s better to minimize the detect ability of the space, and use as few mics as possible. We set Aaron up about five feet from the drums, with a gobo (divider) placed between him and the kit. This helped to reduce reflections as well as direct spillage into the vocal and acoustic guitar mics. Aaron’s guitar a 1976 Martin D-28 (Neil used a Martin D-45) was mic’d with an AKG C-414 microphone in hypercardioid pattern. Originally, Mazer used a Neumann KM 86 (which we didn’t have). My engineer Annie and I matched up the frequency response charts with some different mics and found similarities between the KM86 and the AKG (when in hypercardioid) with a very slight boost at 3khz which we did with console EQ. 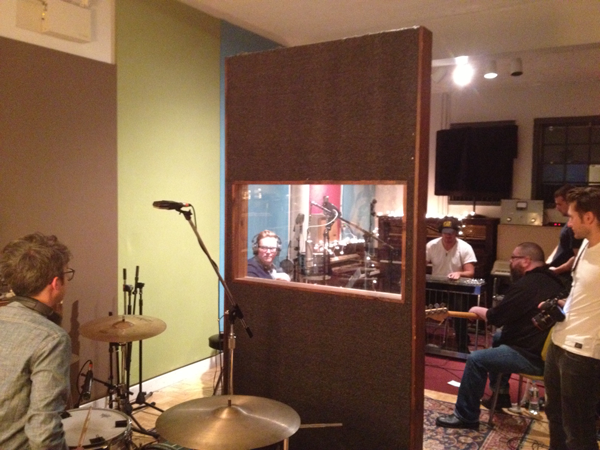 On the drums we used four microphones…kick, snare, hi-hat and a single overhead. To replicate the signature kick drum sound I used a 60’s Rogers 20″ kick drum with no front head and heavily muffled it with a folded up bath towel, and a sandbag to keep it in place. I had planned on using a pillow with duct tape to hold it in place like Kenny Buttrey, but I failed on procuring that particular piece of equipment by the time t he players showed up (it’s always something). Nonetheless, the drum sounded uncanny to Buttrey’s stuffed-up Sonor kick (in the room). I paired it with a Ludwig 5 1/2″ Supraphonic snare drum…the most recorded model of snare drum in history (I heard that somewhere, and believe it too). A perfect match! There are very few tom hits on Harvest, and cymbals and hi-hat are used very sparingly. TNRC revolving cast member-drummer Kenji Ross did a nice job emulating the restraint that was required. Our bassist for the evening was Joe McMahon. I’ve had the pleasure of recording Joe on many occasions and I knew that he’d be perfect for this. He played a Fender Mustang bass with flat-wound strings. Like the harvest sessions, we recorded him with a direct signal (no bass amp), with a solid state mic pre straight to analog tape with no com pression. A moderate boost of 150hz put us right in there. Joe recommended Matt Pynn to play steel, and I was super thrilled that he was available. 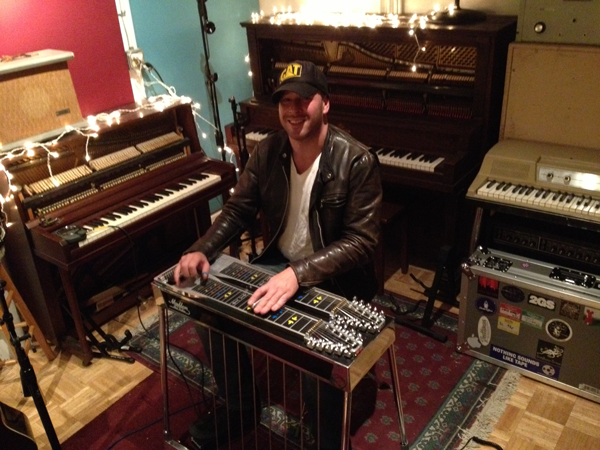 Matt has a true mastery of the pedal steel, and he is one of those guys you see playing with everyone…everywhere. Interestingly, harvest was tracked with no compression on anything. When you’re recording seasoned professionals, they know how to control their own dynamics and in 1971 at ” Quad” that was the case…same as was here last week. The steel was recorded into a blackface Fender bandmaster amp that we mic’d up in the iso-booth. Upon playback, we sent the signal to our Studio’s main reverb…an 8X4 foot analog plate reverb. That, coupled with Matt’s finesse, helped us nail the Harvest steel sound. Th e backing vocals on the song “Heart Of Gold” we’re sung by James Taylor and Linda Ronstadt. They also appeared on the Johnny Cash show with Neil, and they came to the studio and sang their parts in the control room, listening back through the Studio’s monitor speakers. 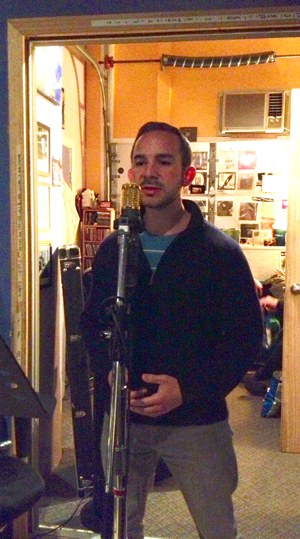 We also recorded our backing vocalist Evan Sanders the very same way. It’s amazing how little of the music track bled into the vocal mic. We double tracked him, as Linda Ronstadt wasn’t around. I played a quick little harmonica part, and a simply strummed acoustic (with a couple of harmonics) and my engineer Annie, played a sparse piano part, matching the instrumentation texture that can be heard in the song “Old Man”. 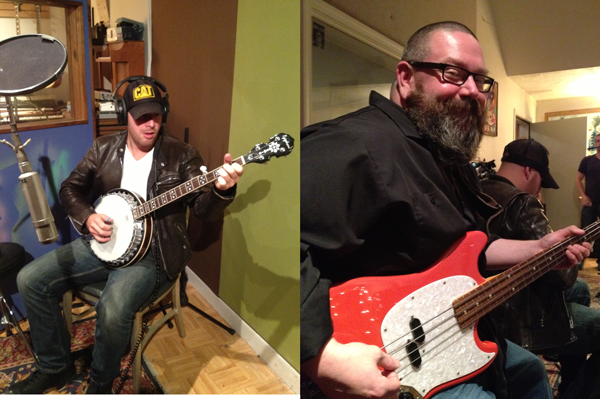 Matt Pynn recorded a quick banjo part too, and all of this worked beautifully together. Looking back on the evening, it’s funny how we managed to create a similar situation to the one they were presented with when recording Harvest. Like Neil, Aaron comes in with a song that no one has heard, everybody learns the form, we tweak the arrangement, and then the bulk of it is recorded live. There is an excitement, and a freshness to a song that is being played and recorded so early in its life. Nobody had time to develop musical parts that become habits. Everyone is listening to everyone else while they are playing their own part…reacting to each other and interacting with each other. This is how many classics were made, and I’m glad that we had the chance to experience it first hand.